In order to determine the best gorilla trekking company in Uganda or Rwanda(East Africa), you need to know how other travelers have fared with this company you want to trek gorillas with. Reviews are very important. They help you know what to expect from the company and also you get to know the quality of services. Read through several reviews before committing to the company. You can get reviews from Trip advisor, Safari bookings and even some companies like F&M Adventure Safaris, have good reviews from google travelers. You can get to see these on the company’s google result page. When you search for a company’s name on google search engine, lookout for the information on the right side of your screen. You will get to see the reviews and ratings of this company. Therefore reviews are a very important aspect when you want to select a particular company for your gorilla trekking safari tour whether in Uganda, Rwanda or DR Congo. You have to do a comprehensive research on the company and you have to be sure that the company will meet your expectations. One of the best ways is to explore the website and read information provided by this company about Gorilla tracking, Gorilla permits and any other information you need for the trekking experience. Do not send inquiries to only 1 company. You need to get the best service you can get. Therefore sending inquiries to different companies will give you a bigger picture about the gorilla trekking experience. Upon receiving the replies, evaluate the responses and make your selections depending on the kind of reply you receive. The reply should be straight to the point and informative. Make sure you ask questions about the Price, Safari cars, Guides, Accommodation, Meals etc. When you have sent in your inquiry, how long does it take for the gorilla trekking company representative to reply to your email? This is a very important aspect when planning the trip. If the response time is very long, then the company is not efficient enough in handling such demanding activity. Incase it takes upto a day with out getting a response, then you can try other companies since there are quite a number of them. It should take between 15minutes to 2 hours to get a reply, otherwise you wont get the best service even during gorilla trekking safari. Gorilla trekking needs a lot of planning and the earlier you get every bit information, the better. Your quest to find the best gorilla trekking company in Uganda or Rwanda can not be complete without this important information. Though it is not a prerequisite to carryout gorilla tracking services, being a member of either AUTO(Association of Uganda Tour Operators) or Rwanda Tours and Travel Association comes in handy in case you get problems on your safari or if you want to find legit tour operators in either Uganda or Rwanda. Before you select the tour operator, make a search on these platforms to see if the company is a member of their respective Union. The first step is to send an inquiry through our Booking page. With in no time, Usually between 5minutes to 1 hour, we respond to your emails and let you know of the next steps. When you inquire about a tour involving gorilla tracking, we check for the availability of the permit on the date that you like to trek and then let you know of what is required. In case you are ok with everything specified in the communication, we send you the Invoice with the quotes and payment details. Your driver guide will drive you to Bwindi impenetrable national park or Mgahinga gorilla park office for Gorilla group allocation. You will be allocated to a group of 8 and you will be led to into the forest by a park ranger and protected by an armed officer. The ranger guide will be in touch with Gorilla trackers who earlier go into the forests looking for the gentle giants whereabouts. When the trackers find the gorilla group, they will then communicate(by radio) with the your Ranger about the exact location of the Gorillas. The ranger then will lead you to the location of the gorillas. The trek through the forest is very exhilarating and not short of adventure. Bwindi impenetrable is very thick, hence its name. As you trek through the forest, you are serenaded by the sounds of over 340 bird species, crickets and monkeys. The ranger is armed with a machete which he uses to pave way to the gorilla location. The sound of the machete cutting through the thick trees and undergrowth gives you a memory of a nature walk to be remembered. On a lucky day, you can get to see forest elephants and other wildlife during the trek. As the machete paves way, the ranger finally gets to the actual location of the gentle primate. The ranger then directs you speaking with a low tone not to disrupt the peace of the gorillas. He will tell you what you should what to do and not what to do when you get closer to the primates. Here you can take pictures (NO FLASH) to keep the memory of this amazing experience. You might need spare batteries and recommended lenses. After the long trek back, your driver will be waiting for you to either take you to the hotel, airport or will lead you to another adventure which can be a cultural tour; Batwa trail, traditional performance or a community walk. The cost of gorilla permits in Uganda currently is $600. In rwanda, it is $1500 and in Congo the gorilla permit is at $400. In Uganda, most travelers prefer a 3 days gorilla trekking safari. However the tour can be 2 days incase you arrive to Bwindi through Kigali in Rwanda. In Rwanda, 1 day is enough. You can arrive very early in the morning, you trek the gorillas and then catch your flight in the evening. It is that simple. The normal 3 Uganda gorilla trekking tour basing on 2 people sharing a room(budget), the cost is about $1130 per person and this includes 2 nights accommodation, car, fuel, meals. A 1 day gorilla trekking tour for 2 people in Rwanda goes for about $1790 per person. Uganda(Bwindi & Mgahinga National parks) Rwanda(Volcanoes national park) and Congo(Virunga national park) are located in the same geographical area only separated by boundaries. Therefore the best time to to these areas is the same. 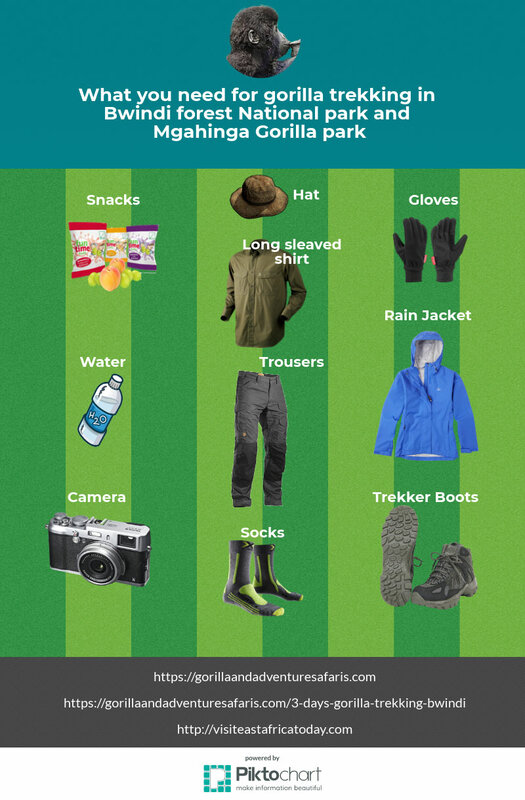 Trouser and Shirts The forests are covered with thick undergrowth, therefore light trousers and long sleeved shirts are advised. A topnotch Gorilla Trekking Company that has been trusted my many a tourist for their Gorilla adventure in Uganda and Rwanda. With the many reviews from our Tripadvisor and google pages, we have established our selves as one of the best Gorilla trekking companies in the business. F&M Adventure safaris is a member of Association of Uganda Tour Operators (AUTO) and we are licensed to carryout Tours in Uganda and Rwanda. Our Budget gorilla tours have been recommended by many travelers and in case you are traveling at a low budget, we are best positioned to carry out the tour, with a normal 3 days gorilla trekking safari in Bwindi Uganda going for a price of $1345(1 person) and $1150( 2 people sharing a room), while a 1 day gorilla trek in Rwanda going for $1950(1 person) and $1800(2 people). Apart from the Gorilla trek, Uganda has a lot of other Adventure safaris to offer that will make your trip worthwhile and unforgettable. Ngamba Island: The home to Orphaned Chimpanzees. A 40 hectares Island dedicated to Chimps. Hello, How much is a 3 days gorilla trekking tour for one person? Thanks a lot for the great work. Hello Kennedy, 3 days gorilla trekking safari cost for one person is $1340 with budget option. 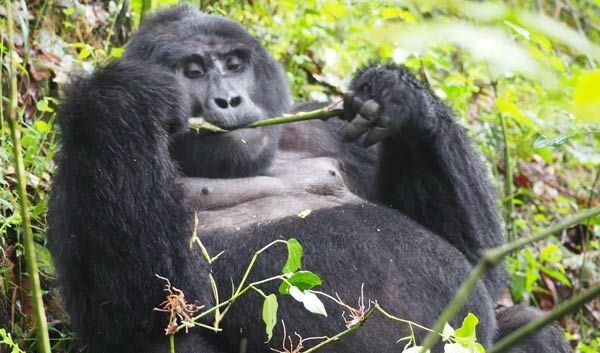 you can make a booking through this inquiry form : https://gorillaandadventuresafaris.com/gorilla-trekking-rwanda-uganda-safari-booking-form for more details. Yes festo. there is a very good chance if you plan early since the gorilla permits are very competitive at this stage.